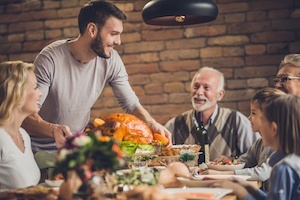 Home / Turkey Talk—Maintain a Cozy Home This Season! When most of us think about the holidays, we conjure up visions of what a cozy holiday home should be. Perhaps you think of a festively decorated family room with a crackling fireplace, strands of twinkling lights and an oversized cozy recliner draped with a fuzzy, holiday blanket. Just the thought of this scene gets us giddy with excitement for the upcoming winter months. Of course, we know that a cozy, well-lit home during the holidays isn’t always cheap—and trying to maintain constant warmth isn’t easy either. Fortunately, when it comes to indoor coziness and money-saving secrets, Cool Techs has a great deal of experience. And we are here to lend a hand and unveil some warm, cost-cutting tips! OK, the temperature has plummeted, the wind is whipping at your back and those outdoor treks have simply gotten, well, very, very frigid! So, the more time you spend inside your happy home this season, the warmer you want it to be. But thermostats set at higher temperatures, excessive oven use from turkey baking and even decorative holiday lights have the tendency to jack up that energy bill. As the winter chill sets in, everyone is searching for the best tricks to help put money back in our wallets—while still keeping us warm. Here are 11 ways to maintain holiday warmth and help you save some bucks, too. Upgrade today. If your heating system is over 15 years old, it is time to consider a new one. A new, high-efficiency system will pay for itself in a few years. Use curtains. Close curtains at night to help insulate rooms. Open them during the day to let in bright sunlight and added warmth. Insulate! Insulate rooms that are often forgotten such as the attic and basement. Doing this will keep heat trapped inside your home. Use smart settings. Program your thermostat for lower temperatures—both at night and during the hours you aren’t home. For every degree the thermostat is lowered, you can save up to 2 percent each month on your utility bill. Check vents. Be sure furniture isn’t blocking heating vents! Try air sealing. Eliminate drafts and cold spots by sealing any cracks and openings that are preventing your home from staying at its coziest. Furnace or boiler check. Be sure your systems are running efficiently. Call Cool Techs for a full maintenance check. Build a fire. If you’re fortunate enough to have a real fireplace, throw some logs on the grate, turn down the thermostat and enjoy the free warmth. Pile on the blankets. Everyone has a favorite blanket. Grab your special fuzziest, coziest throw and snuggle on the couch by that fire! Try window insulation. Drafty windows? Insulation will help that problem and save money on your electric bill, too. Use a timer. Put holiday lights on a timer so you’re not paying for electricity all night long. And don’t forget that the best way to secure a worry-free home this winter is with a fall/winter maintenance inspection from Cool Techs. 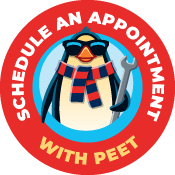 Our certified techs will give your heating system a thorough checkup so you’ll be satisfied—and cozy—all winter long. Call us today at 866.315.8642 for all of your heating needs.